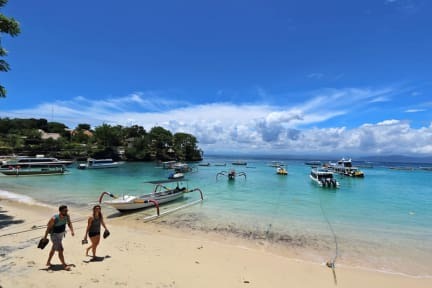 It is in the center of Lembongan Island and only located stone throw way to the nearest Beach and 10 minutes ride by scooter to the famous beach such as Dream and Mushroom beach. Everything is accessible and we provide an easy base point for you to explore the island. Featuring modern Balinese wooden style design in Balinese family environment. We have a wide range of Air-conditioned rooms to accommodate all types of travelers. Bed in a mixed dorm is designed to feel more private than your typical dorm room. Dorm beds have individual curtains to provide you with more privacy, individual electricity power socket, and reading lamp. individual safety box lockers are provided to keep your valuable things. At the hostel, you can meet friends from around the world, enjoy free WiFi in all rooms including hostel area, relax in the spacious common lounge with a big flat screen television. Our family-friendly member will be more than happy to provide you with all information about the island. Lovely beds, lovely breakfast, great WiFi, and pretty good location on a small island. Absolutely recommend. Clean, and very comfortable bed with soft sheets. Good quality bunk beds that don’t make noise with movement and huge rooms with high ceilings were great. This place is definitely worth staying at on Lembongan! Perfect spot to access Cenigan. While being mindful that the property isn't huge and therefore has little space to meet others, there are some awesome bars just across the yellow bridge for that! The owner went above and beyond for me and when I missed my transfer to the port he quickly rode me there himself for no extra charge. Nice rooms! Breakfast could be better. The hostel was nice and clean, and the staff was super friendly! The walls are like paper so you can hear every noise coming from the next room and outside, but other than that this hostel is great value for money! This hostel is a good one! The rooms are so large and with the amount of 4 people in one room, it’s easy to meet new people. The bathroom is fine and the breakfast too! The only thing to criticize is, that there is no big chilling area, where it’s easy so meet new people and get in contact to the other travellers. But at all, I think it’s perfect for a backpacker. Next to the little yellow bridge to nusa Ceningan and to the famous beaches. Love this place. Soo cute and homely. The staff that run it are really nice and helpful. The beds are amazing and the rooms are huge! Would defo recommend!!! I had an ok stay here. The staff were a bit self Absorbed and th steet noise was loud ... I wouldn't stay again. Very frustrating experience. I called the owner to say that we wanted to move our reservation to the next day, since we were on another island and we couldn't make it the day we reserved. He said no problem and changed our reservation. BUT when we showed up, he said there was no room for us and he didnt trust my word that we would show up. He didnt tell me this until AFTER we arrived. He tried to send us to a 7 star hostel and we said no. We stayed somewhere else. Owner was rude and not helpful. Looks really nice, the beds are huge and new but the rooms are so tall that they're hard to cool down (esp hot on the top bunks) and the walls are PAPER THIN. It's on a corner so you can hear the bikes and cars beeping all day/night and any dogs, roosters, people talking outside the room - forget about it. Very basic free breakfast was a nice extra and the staff was helpful enough but I had to relocate hostels bc of the noise and heat.